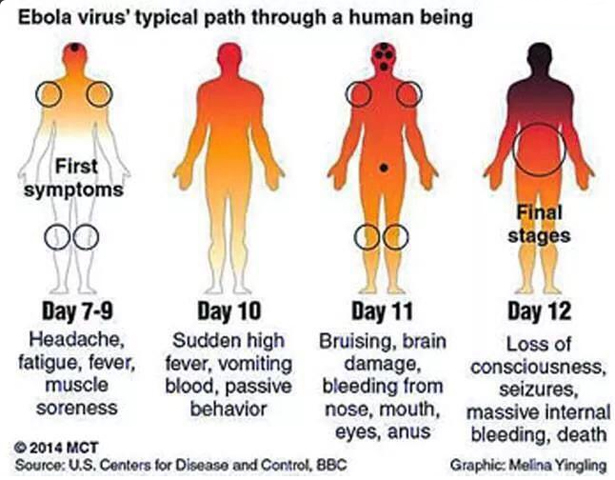 How are you going to keep Ebola or Enterovirus D68 out of your house? How are you going to make sure that your home is the one safe place you and your family can go to seek shelter from the super bugs that keep emerging daily in our society? With a few simply steps, a few dollars, and a little bit of knowhow, you can set-up a in home decontamination station that will, if used correctly, eliminate most if not all possible contaminates that your family could be bringing into your home. 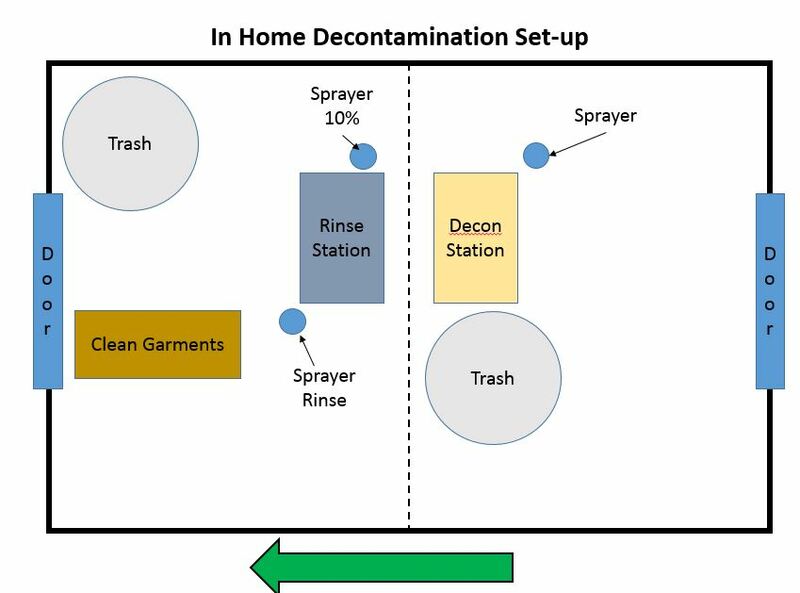 First let’s take a look at some of the materials you will be needing for an in home decontamination (decon) station. The construction of the decon station is a relatively simple undertaking that does not take a lot time. The most important thing in the construction is to remember that everything must be sealed airtight. Any leaks or holes will allow the virus or any other contamination into the rest of the house. Select an entry door with an area large enough that a person will be able to undress without touching a wall. Encase the entryway with 6 mil plastic, to include the ceiling, walls and floor. Tape all seams and hole in the plastic. Cut a spilt in the plastic in both the entry & the exit. Cover the spilt in the plastic at the exit with another piece of plastic. Ensure that both the top and the bottom are taped and sealed. Also tape and seal one side. Cover the floor with another piece of plastic. You may want to double this sheet of plastic to help protect the floor from the bleach. Once the construction is completed, you will begin the place the decontamination equipment inside the decontamination station. Use the drawing below as a guide for placement of the equipment. For the first decontamination solution it is recommended to use a 10% bleach solution for decontamination solution however, you may want to mix it stronger, but not too much stronger. The second decontamination solution should be mixed at 10% bleach solution. There should be no need to mix this solution any stronger. Now let’s move on to the basic theory of how this concept will work. Spray yourself down beginning at the head and working your way down to the feet, including the soles of the shoes. Wait 5 to 10 minutes to allow the bleach & water solution to work. If your outer garments are soiled, use a brush to remove and or loosen the dirt and re-spray the area with the bleach & water solution. Once the time has passed, sit in to the Decon Station (tub) and begin to re-spray your entire body. After the second spraying, begin to remove your outer layer of clothing. Begin with your shirt, pulling your shirt inside out if possible placing it in the trash container. Remove your shirt leaving your gloves on. Remover your pants in the same fashion as your pants leaving your shoes or shoe covers on. Place your pants in to the trash container. Remove your shoes one at a time stepping across in to the Rinse Station (tub). Remove your mask and place it in the trash container. Remove your other shoe the same way you did the first. Move your shoes/covers and place them in the trash container. Remove your gloves by pulling them off inside out over the trash container and allowing the gloves to drop into the trash. Spray yourself again, in the same fashion as before with the 10% bleach/water solution. Once you have sprayed yourself down again, rinse yourself off in the same manner. Step out of the rinse contain. Move to the clean garment area and dry yourself off. Place the towel in the trash can. Once dry, put on clean garments or move out of the area. The idea behind this decontamination station is to keep the agent (virus) contained or killed in this area. Once you process through the area, the contaminated waste will have to be disposed of properly. Remove waste to a disposal area. Double bag all waste generated from decontamination area. Remove all waste to a disposal area. If you can and have an area that is suitable, burn all the waste generated from the decontamination procedure. The incineration area should be in a wide open area and should be contained to a container. Make sure that ALL the waste in incinerated. The only thing that should remain of the contaminated waste is ash. No other remnants should be left of any item, just ash. If you have made it this far through the article you are probably wondering why you should trust this article. I spent almost 14 years as a Nuclear, Biological, Chemical soldier for the US Army. I have studied decontamination extensively and have performed live agent decontamination missions. These procedures are taken from those the US Army uses for this type of operation. Remember, you can kill a virus, you can neutralize chemicals, but you can only move spores.